Listening to Dr. Barry Noon, I was busy being amazed at the effort put into predicting the occurrence of a species that is most probably extinct. His take on Animal Planet’s documentary on finding the elusive Big Foot (or Sasquatch in North America), snapped me out of it. I later searched for the episode he was talking about and found this (Animal Planet video). Now I don’t know much about Big Foot, but grown men and women grappling in the dark, quite literally too, about the existence of an urban legend is just sad. But before that, while mentioning to Kartik how funny Dr. Noon’s take on the ‘Big Foot Adventures’ was, he told me of two scientific papers on yetis and sasquatches (both PDFs). Still unsure about who the joke really was on, I went through the papers. From J. D. Lozier et al. The Sasquatch paper was quite a good read. It warns of the perils of using Ecological niche models (ENMs) and species distribution models without sufficient rigour, in a tongue-in-cheek manner. ‘The basic premise of the ENM approach’, the article says, ‘is to predict the occurrence of species on a landscape from georeferenced site locality data and sets of spatially explicit environmental data layers that are assumed to correlate with the species’ range.’ As I understand it (and it’s probably the first real attempt to understand it), ENM is about predicting the potential distribution of a species knowing its present extent from your own and others data. 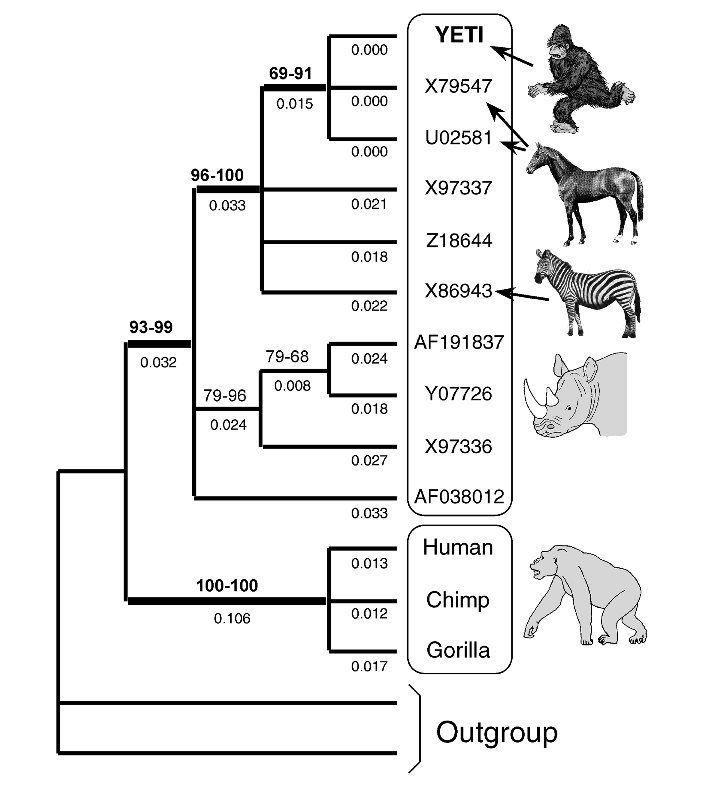 Now the possible caveat in this addressed by the article, is the problem of ‘poor taxonomy and/or misidentification’. They constructed ENMs for sasquatches using putative sightings, auditory detections and footprint measurements; and for black bears using records backed by physical specimens. 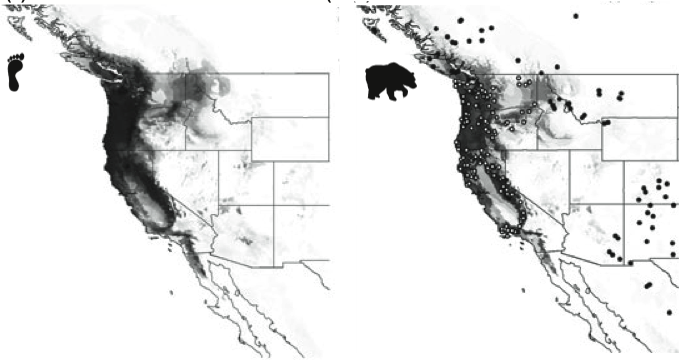 What they finally show is a highly suspect model where the current distribution of sasquatch and black bear overlaps to a large extent. Now that’s making a point like a boss! From M.C. Milinkovitch et al. I never had any doubt that scientists have a twisted sense of humour, but it’s good to see scientific journals having one too! Finally, I think this makes for a fitting follow-up blog (incidentally) to what Hari wrote about doubting his observations given the biases; not that I think Hari will mistake a black bear for a sasquatch, or see a sasquatch for that matter!